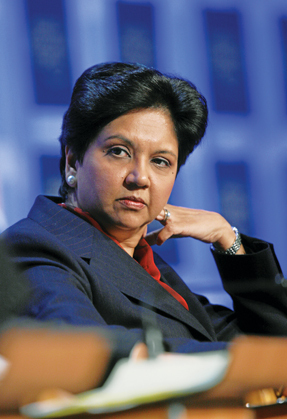 For the fourth year in a row, Indira Nooyi, chairman and chief executive officer of PepsiCo, has topped Fortune magazine’s annual list of the most powerful women leaders in business. Earlier, Nooyi was ranked third on Forbes’ list of the world’s most powerful women, just behind German chancellor Angela Merkel and FDIC’s Sheila Bair and well ahead of 13 ranked Sonia Gandhi. Most powerful women business leaders, fine, but third most powerful woman in the world? Come on, really?